Fabien Moreau, a qualified oenologist, represents the sixth generation of his family to be responsible for this fabulous holding, which includes 6 hectares of Grand Cru, and 5 hectares of the 1er Cru Vaillon, the latter including a parcel planted in 1934. He is making is making superb Chablis, characterised across the board by brilliant precision, complexity and depth. Vineyard management precludes the use of herbicides and pesticides, incorporating instead soil-tilling and ‘sexual confusion’ (the use of pheremones to dash the salacious intentions of unwanted insects, widespread now in Burgundy) and the use of only organic fertilisers. The grapes are harvested by hand and subjected to a thorough sorting prior to reaching the press, thereby ensuring that the full potential of these wonderful terroirs remains intact when the fruit reaches the cuverie. The village Chablis is vinified in stainless steel, whilst the 1er & Grand Crus see varying amounts of oak, though little of it is new. 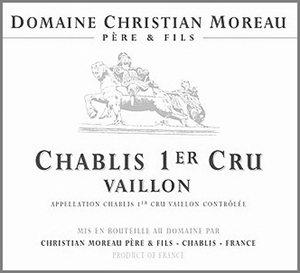 These are classic Chablis that do require a little patience, most particularly in the case of the Grands Crus, which always repay a minimum of 5 years cellaring, when their astonishing mineral complexity really begins to reveal itself. Chablis at all levels currently represents significant value relative to the prices now being commanded by white Burgundies from the Côte d’Or, a situation which may well change. We urge you to try them and to judge for yourselves.